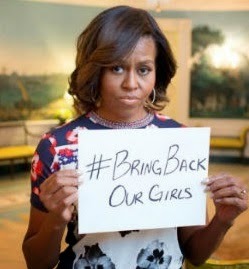 While Michelle Obama and her celeb friends pose for pouty selfies denouncing Boko Haram and its abduction of Nigerian school girls, I've seen no references in U.S. media that have bothered to mention that the violence in Nigeria takes place in a nation that bans civilian ownership of all but the must rudimentary of firearms. While some African media merely say the Nigerian police must do more to enforce gun bans (while admitting efforts to date haven't worked), there are other voices who have long been calling for wider availability of guns in civilian hands for self-defense. Best I can tell, Nigeria's government remains unwilling to consider allowing its law abiding people access to firearms as a means of self defense. In recent years, the government has actually become more restrictive in its limited licensing of civilian arms. Update: Dave Workman at Examiner.com reports some Seattle area media have included restrictive Nigerian gun control in coverage of Boko Haram developments.